Ribbons with Purpose! 3 Useful Designs: Old and New Testament Each Include 5 Colored Ribbons, Bookmark that List Each Bo ok of the Bible with Space to Write Corresponding Page Number. 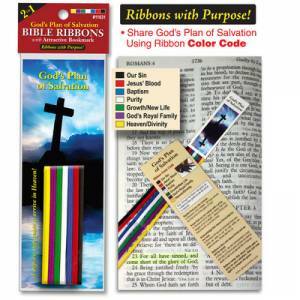 God’s Plan of Salvation has 7 Colored Ribbons and Bookmark with Color Code Plan. BIBLE RIBBONS WITH BOOKMARK GO by G T Luscombe was published by LUSCOMBE #129 in September 2012 and is our 3616th best seller. The ISBN for BIBLE RIBBONS WITH BOOKMARK GO is 634989116317. Be the first to review BIBLE RIBBONS WITH BOOKMARK GO! Got a question? No problem! Just click here to ask us about BIBLE RIBBONS WITH BOOKMARK GO.